Elizabeth Zimmerman started Western Rose Studios in 2014, just a couple years after graduating from art college. Before that she operated solely under her name working with watercolors and paper. The time came to push her art career forward, thus the birth of Western Rose Studios. Inspired by the great outdoors, Elizabeth soaks in the majesty of the Pacific Northwest: the smell of the forest after a Spring rain, the crunch of autumn leaves underfoot, the song of the redwing blackbird, the soft eyes of a quiet doe, the infinite shades of sunrise and sunset, the list goes on. 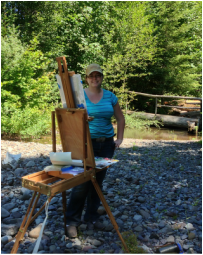 During the warm, dry months in Oregon, with paints, brush, and paper tucked into a portable easel, Elizabeth ventures out on trails and along rivers to capture the light and color of the landscape. And with a camera slung around her neck, she composes sunlit images which capture that very moment to use as a painting reference in her studio. Looking, seeing, depicting what is around. Elizabeth is fresh to the world of Cowboy Western Art. As a sixth-generation Oregonian, she was raised in the Willamette Valley on her parents’ 5-acre hobby farm. She had little adventures with her best friend, a Shetland/Welsh pony named Stardust. Even though Elizabeth never grew up on a ranch, she worked for three summers at Boy Scout camps as a horse wrangler where she experienced a taste of the cowboy life. 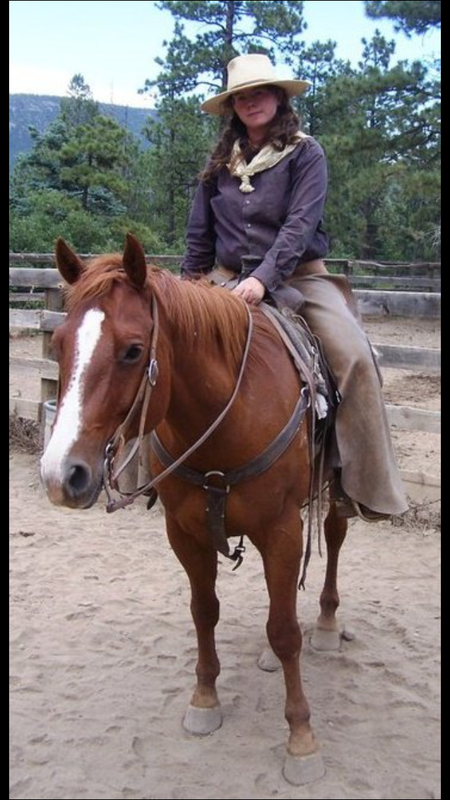 She worked near Dufur, Oregon at Camp Baldwin teaching scouts about horses and leading trail rides along with participating in the cowboy campfire reciting poems and strumming her guitar. After two years of working with the CL Bar herd of horses, she tried her hand at working in New Mexico at Philmont Scout Ranch. While in New Mexico, Elizabeth topped off horses, shoed, jingled, and participated in an 18 mile burro drive. Along the way she took many photos of the cowboys, cowgirls, horses, and the scenery to use as references for her paintings. Many of the watercolor paintings are based on these first-hand experiences. Now, years after working as a wrangler, Elizabeth attends a couple western events a year to photograph more references for her watercolor paintings. Many of the watercolors have a story behind them, which usually features cowboys and cowgirls she has met. She first learned how to manipulate watercolors in 2005 in a class at a senior center in Eugene, Oregon. 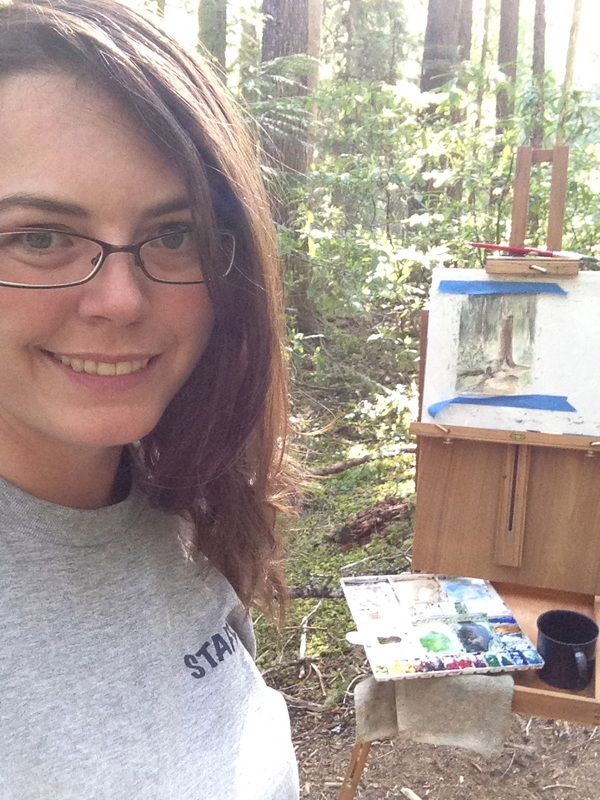 She continued her art education with an Associates of Science in Fine Art at Linn-Benton Community College in Albany, Oregon and then graduated in 2012 with Bachelors in Fine Art degree from Oregon College of Art and Craft in Portland, Oregon. Currently, Elizabeth is working full time as aa Executive Assistant for a family-owned company in Portland, Oregon. She lives in Gresham, Oregon with her husband, John, who accept the ever-present paintings, frames, and piles of paper that have crept out of her studio and onto the kitchen table. She accepts commissions and continues to find venues to showcase her watercolor paintings. Elizabeth’s paintings have been shown at the Caswell Gallery (Troutdale, Oregon), Rogue Gallery (Medford, Oregon), Hoffman Gallery (Portland, Oregon), Thirst Bistro (Portland, Oregon), North Santiam Hall Gallery (Albany, Oregon), Fall Festival Showcase (Corvallis, Oregon), and Scandinavian Festival (Junction City, Oregon). She has received many honors, including having her art and designs featured on multiple wine labels: 2012 Oak Knoll Rose Festival Collectors Series Pinot Gris, Pinot Noir, and Rosé of Pinot Noir; and Thirst Bistro's red and white table wines. Elizabeth’s art has also been recognized for honorable mention at the Yamhill Lavender Festival Plein Air Art Show (2012). Her most recent recognition is Best of Show in Watercolor at St. Paul Rodeo Wild West Art Show (2014) in St. Paul, Oregon.